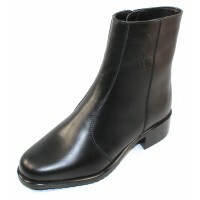 Inside zipper boot with strap and buckle ornamentation. Elastic outside panel. Cozy warm textile linings. RIbbed rubber sole for traction. 1 3/4 inch heel. Made in Finland.